Jersey Daisy Chain of Muskat Crochet sweater with round yoke in DROPS Muskat. Elaborated from top to bottom with pattern of drafts. SIZES:S (600gr.) - M (650gr.) - L (750gr.) - XL (800gr.) - XXL (900gr.) - XXXL (950gr.) INCLUDES PATTERN SAMPLE:18 high points wide and 9 rows vertically = 10 x 10 cm. 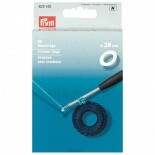 Use a 4mm crochet hook. 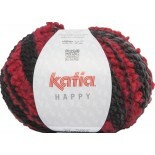 Happy Katia is a wool that combines two colors with a striped effect and texture loops. 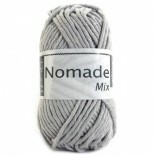 It is machine washable up to 30 ° and can be ironing at low temperature.Composition: 54% Virgin Wool and 46% Acrylic.Each skein has 100 grams. - 120 meters. 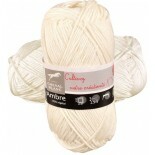 It is knitted with knitting needles of 8-9 mm.You need 3 skeins to knit a long-sleeved jersey Size 42. 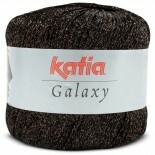 Harmony Katia, a special texture yarn with very soft and nice hair. 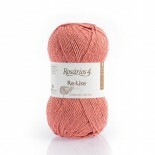 Machine washable up to 30 °.Composition: 38% Merino, 37% acrylic and 25% polyamide.Each skein is 50 g. - 95 m. It is knitted with needles 5.5 to 6 mm.With 9 skeins you can knit a sweater, long sleeve, size 42. 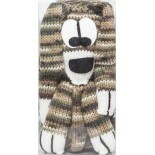 Dog Scarf "Lanas Katia".Is a special kit for a scarf in the shape of a puppy. 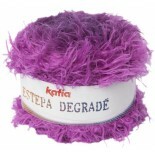 The kit contains the head, legs and tail of the cat, already made and a ball of yarn 100g, 80% Acrylic, 20% Wool. 270 meters. Includes instructions and is very easy to do. Knitting with needles of 4.5 to 5 mm. 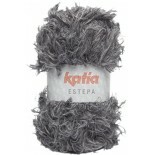 Estepa de Katia is a very soft wool long hair. Ideal for outerwear and accessories. Composition: 90% polyester and 10% polyamide. 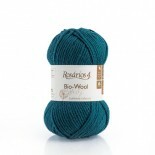 Each skein is 100 g. - 95 m. It is woven with needles 7 to 8 mm. 6 skeins you can knit a sweater, long sleeve, size 42. And with a skein that can make a fabulous neck. 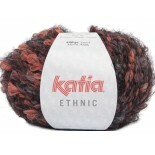 Ethnic by Katia is a thick, curly wool long hair. Ideal for outerwear. Composition: 50% acrylic, 35% polyamide, 10% wool and 5% polyester. 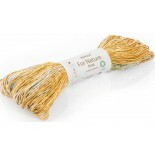 Each skein is 100 g. - 85 m. It is woven with needles 10 to 12 mm. 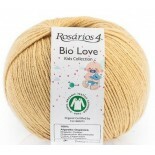 With 5 skeins you can knit a sweater, long sleeve, size 42. And with a skein that you can make a cover neck. 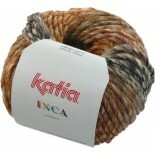 Katia Quetzal, a wool alpaca fashion trends striped effect. 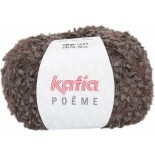 Composition: 88% Superfine Alpaca and 12% Polyamide. 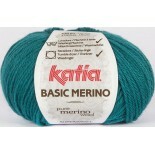 Each skein is 50 g. - 140 m. Worked with knitting needles 6-7 mm. With five skeins can knit a sweater long sleeve size 42. 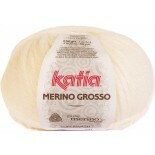 Katia Merino Grosso, is a classic very soft superwash merino wool 100%. You can machine wash up to 30 °, tumble dry and low iron. Composition 100% Merino Wool Superwash. Each ball has 50 grams or 60 meters long. 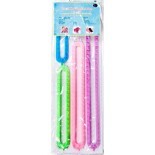 It can be knit with knitting needles 5.5-6 mm or crocheted needle 4.5 mm. With 12 balls size 42 jersey knits. 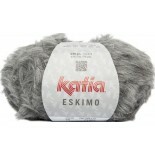 Eskimo from Katia, is a very soft yarn with nice hairy texture. 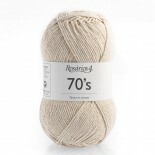 Machine washable up to 30 °.Composition: 38% Polyamide, 28% Acrylic, 25% Alpaca, 9% Merino Wool.Each skein is 50 g. - 90 m. It is knitted with needles 5.5 to 6,5 mm.With 6 skeins you can knit a sweater, long sleeve, size 42. And with one skein you can do a warm neck cover. Colorful faux fur pompoms.Perfectly topped come with a loop so that they can put on and take of your clothes. 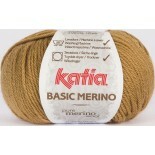 Ideal for hats and scarves.Composition: 95% Viscose 5% Polyamide. It is composed of: 90% Polyamide and 10% Polyester.Each ball contains 250 grams.Work with 7 - 8 mm knit needles.With 1 ball you can weave a shawl of 140 x 52 cm.To knit a jersey of the size 42 in long sleeve are necessary between 2 and 3 balls.It is suitable for machine washing at a maximum of 30ºC.It is suitable for ironing up to 110ºC. 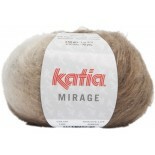 Mirage by Katia is a soft long haired wool, made with natural fibers.Composed of: 72% Super Kid Mohair, 18% Merino and 10% Cotton.Work with knitting needles of 7 to 8 mm.Each ball contains 50g. 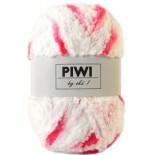 and 90m.You can knit a sweater, long sleeves, in size 42 with 5 balls.Machine washable up to 30 ° C. You can iron it. Katia Urban Magazine Women n 99. 50 looks for women, the latest fashion. Includes diagrams and pictures. Instructions in English and Spanish. Lanas Katia Baby Magazine No. 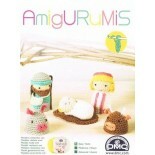 86 2018/2019 Autumn / Winter.A magazine with 52 special creations for your baby.Instructions in Spanish and English. 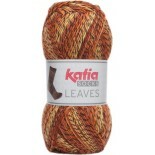 Katia Love Wool, a natural wool blend wool and alpaca very thick, great for collars, scarves and accessories. Composition: 85% Virgin Wool and 15% Alpaca Superfine. 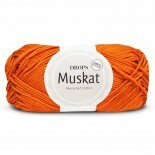 Each skein is 100 g. - 50 m. Worked with knitting needles 12-15 mm or crochet needles of 9 mm. With two skeins can knit a neck. 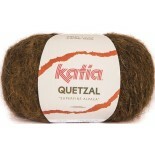 Azteca Milrayas is a version of our Azteca yarn, but with fine defined lines. 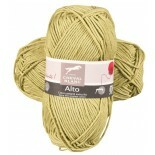 The unexpected chromatic effect of this spongy soft yarn is ideal to liven up winter garments. 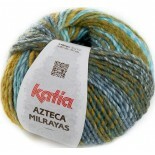 Azteca Milrayas is a great yarn to make striped jumpers in bright colours, fun hats and colourful scarves. 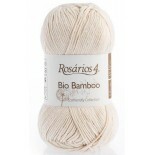 53% Wool - 47% Acrylic.100 grs.180 mts. 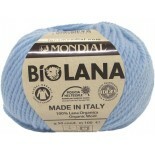 Composition: 100% organic wool. 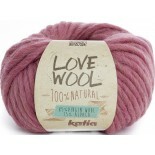 Natural color without harmful substances.Each skein contains 50g. 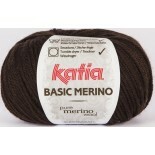 100 m.Working with knitting needles 4.5mm and 5.5mm crochet.To knit a long-sleeved sweater in size 42 9 skeins are needed.Handwash. 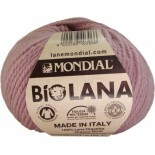 Composed of: 80% Polyamide, 10% Mohair and 10% Acrylic.Each ball contains 50 grams and 145 meters.Work with 4.5 - 5 mm knitting needles.To knit a long-sleeved jersey in size 42, 7 balls are needed.Machine wash at max. 30 ° C.Ironing at 110ºC max.It is not a wool suitable for using a dryer.Horizontal drying is recommended. 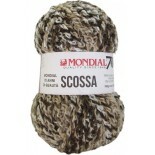 Scossa Mondial is an elastic lycra wool for tight-fitting garments.Composition: 95% Acrylic 5% Lycra.Each ball contains 100 grams and 150 m.Working with needles 6 to 7 mm and 7 mm crochet.To make a long-sleeved jersey, size 42, 5/6 skeins are needed.Machine washable up to 30 ° C. Do not iron. 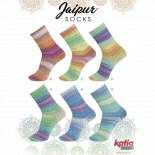 Katia Jaipur Socks is a superfine yarn perfect to create baby booties and original and customized socks. 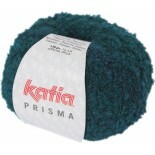 This colourful yarn combines different colours and it is made of cotton, wool, polyamide and polyester fibres. 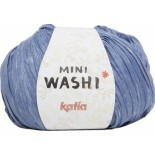 This yarn is Superwash treated. 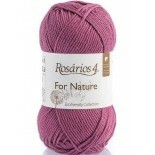 Composed of: 41% Wool, 41% Viscose, 17% Polyamide and 1% Spandex.Each ball contains 50 grams and 200 meters.Work with 4.5-5 mm knitting needles.It takes five strands to weave a long sleeve jersey of size 42.Machine wash max. 30 ° C.Ironing at 110ºC max.Not suitable for tumble dryer use.Horizontal drying is recommended. 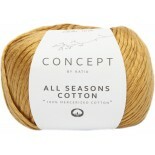 All Seasons Cotton from the Katia Concept range is a soft, lightweight wool.Composition: 100% combed and mercerized cotton.Each ball contains 50 g and 130 m.Knit with 3.5 - 4 mm needles and 3.5 - 4 mm crochet.To make a long sleeve jersey, size 42, you need 8 balls.Machine washable at max. 30 ° C.It can be ironed. 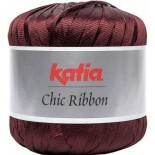 Katia Chic Ribbon is a thick ribbon woven with glossy shine. 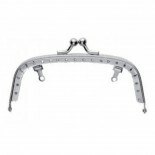 Ideal for garments, accessories, accessories, decoration, etc. 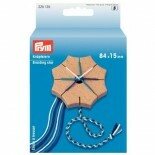 It is knitted with knitting needles 8-9 mm or 5-6 mm crochet. 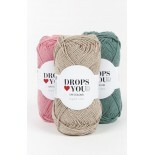 Each skein has 100 grams and 85 m. Composition: 100% Polyester. 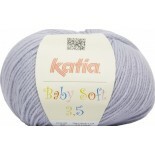 Baby Soft 3.5 of Katia, a very soft classical wool, perfect for any garment you want to knit. 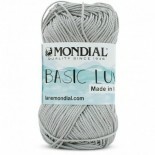 It is machine washable up to 30 ° and you can iron at low temperature.Composition: 50% acrylic and 50% polyamide.Each skein is 50 g. - 160 m. It is knitted with needles 3-3.5 mm.With 7 balls can make a size 42 with long sleeves. 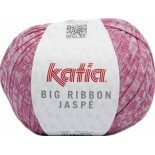 Katia Big Ribbon Jaspé, is a thick woven ribbon-like trapillo, is lighter, rife as trapillo 800g, and can have as many color hanks needed. 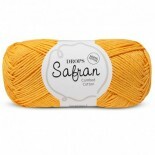 Ideal for accessories, accessories, decor, etc..Worked point needles or crochet 12-15 mm 9-10 mm.Each skein is 200 grams and 60 m.Composition: 45% Cotton 55% Polyester. 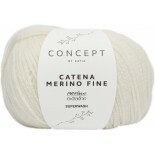 Catena Merino, from the Concept range of Katia, is an extra-large volume wool.It is composed by: 94% Merino Extrafine Superwash and 6% Polyamide.Each ball consists of 50grs and 120m.Work with 5.5 - 6 mm knit needles and 5 mm crochet.To make a jersey of size 42 you need 7 balls.Machine washable up to 30ºC.It can be ironed up to 110ºC. 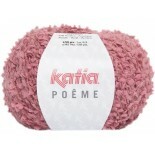 Katia Darling, a wool with a colorful very original. Can Machine washable up to 30 ° and low iron. Composition 60% Superwash Merino, 40% polyamide. 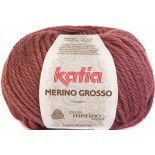 Each skein has + / -50 gr. + / - 190 meters. 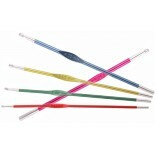 Knitting needles are about 2.5-3 mm or 1.75 mm crochet needles. With 6 skeins can knit a sweater size 42. 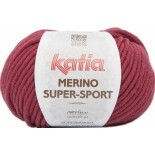 Katia Merino Super Sport, is a classic very soft wool. 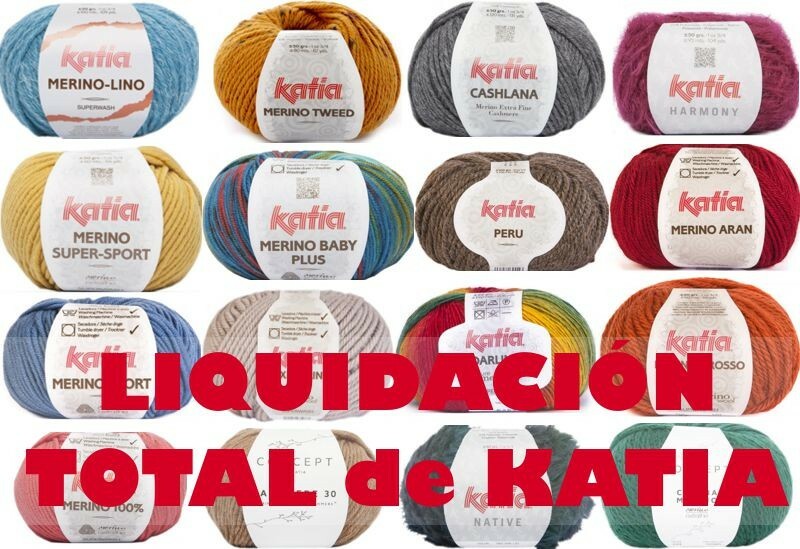 It is machine washable up to 30 °, tumble dry and low iron.Composition 98% Wool Merino Superwash and 2% PolyesterEach ball is 50 grams and 60 meters long.You can knit with knitting needles 6-7 mmWith 14 balls you can knit a sweater size 42. 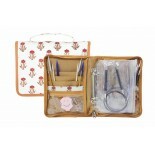 Made from stamped cloth.Intelligently designed - can store up to 16 pairs of Fixed Circular Needles.Couple of additional pockets provided to store those little extras!Zippered case provided to keep all bag contents secure.Dimensions:When Open: 33cm x 21.5cmWhen Closed: 16cm x 21.5cm Does not include needles. 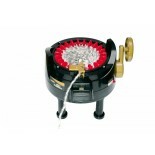 With 22 needles ADDI EXPRESS PRO can knit tubular pieces 15 to 20 cm in circumference (according to the thickness of the wire) or flat parts 15 and 20 cm wide. Very easy to use and quick knitting.It is used with wool to needles 4-8 mm, can knit with finer wool double-stranded.Includes User Guide and CD. 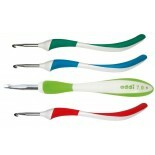 Crochet KnitPro SoftFeel of soft, ergonomic handle, aluminum, very nice and comfortable. Practical case for needles made of wood Addi brand. External dimensions 22 cm x 14 cm x 4 cm. 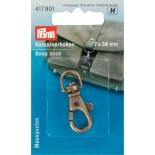 Hinged lid and brass closure.Keep tidy and protected your favorite needles. 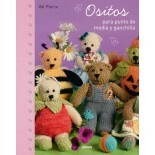 Forty models of basic types of knitted and crocheted teddy bear, each with twenty different attire and easy to read patterns. Books in Spanish. 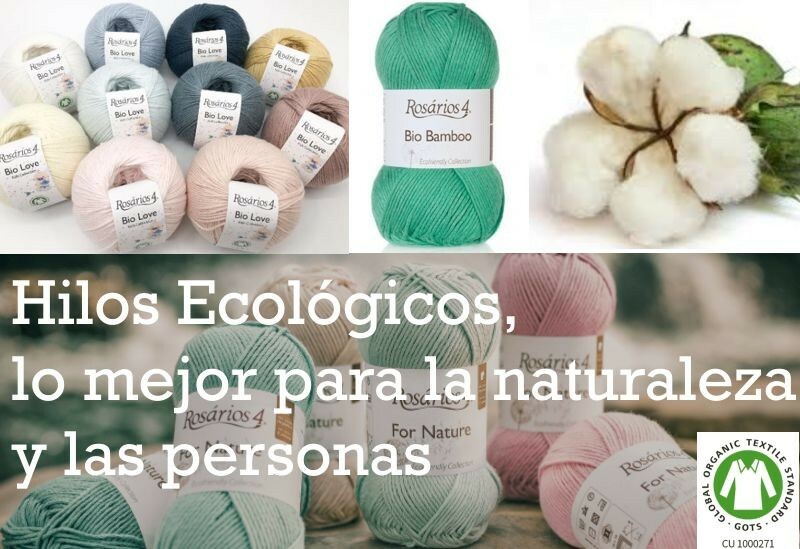 THE WARMTH AND BEAUTY OF ANIMAL SKINS to be enjoyed, ADMIRED AND NO snatched ...Fox, is a yarn that mimics the skin, a whole Spanish brand innovation Lanas Stop.Composition: 97% Rayon and 3% Polyamide.Balls of 50 gr and 24 meters long.Needles: 7-8 mm. 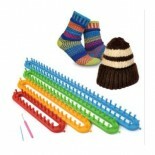 Rectangular knitting looms.Ideal for making hats, socks, blankets, scarves, fingerless gloves, blankets, ponchos and more.The set consists of 4 looms, 25, 35, 46 and 56 inches.They are lightweight and very sturdy, needle loom Coverage includes and other wool.Step by step instructions in Spanish. 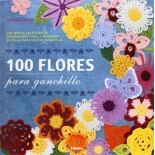 A nice collection of floral decoration and patterns of leaves for crochet thread. 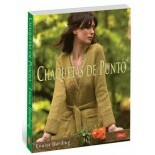 Book in Spanish. Thick thread of certified organic cotton without toxic waste. 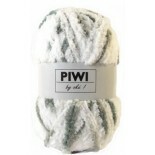 Ideal for all kinds of garments.Clew Weight: 100g. 140m.Working with needles 5 - 6mm.To weave a sweater female medium size needed 10 balls.Machine washable up to 40 ° C.You can iron. Art. 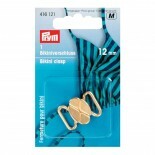 416121 Clasps for bikinis and metal belts in the shape of a clasp of 12mm golden color. With protection against rust. Package of 1 unit. 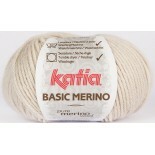 Basic Merino - A versatile classic wool suits any outfit you want knitting, merino wool is gentle on the skin and the finish is perfect. Superwash is allowing you to use up to 30 º washer and dryer.Composition: 52% Superwash Merino and 48% Acrylic.Each skein is 50 g. - 120 m. 3'5-4 mm needles.With 8 skeins can knit a long sleeve jersey T42. 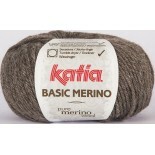 Zing KnitPro Crochet Very light metallic needles in metallic striking colors. 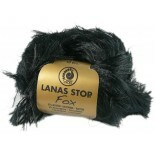 The touch is very soft and pleasant, weaves very easy. 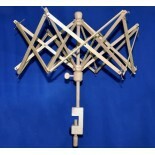 Available measures, 2.00, 2.50, 3.00, 3.50, 4.00, 4.50, 5.00, 5.50, 6.00. 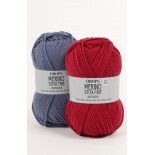 Zing KnitPro crochet set Very light metallic needles in metallic striking colors. 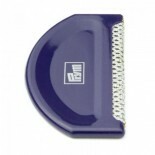 The touch is very soft and pleasant, weaves very easy. Set of 9 crochet hooks. Measures included in the set 2.00, 2.50, 3.00, 3.50, 4.00, 4.50, 5.00, 5.50, 6.00.Includes a practical case to store them and can take them anywhere. 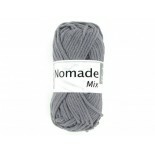 Nomade Mix from Cheval Blanc is a thick yarn, cotton blend, ideal for summer clothes, fashion and decoration. Composition 50% cotton and 50% Acrylic, each skein weighs 50 gr. 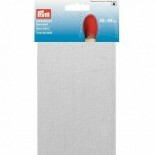 and measures 50 m. Knitting needles / crochet 5 to 5.5 mm. Sample 10 x 10: 14 points x 20 laps. Yarn with glitter for party clothes: 100% polyester. Weight 25 gr., + / - 125 meters. Size of 2,5-3 mm needles. 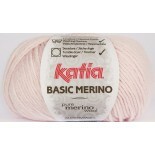 Bright aspect mercerized cotton.Composition: 100% Cotton.Each skein contains: 120 m = 50 g.Work with 3-4mm needles.To make a dress of size 42 you need 9 balls. 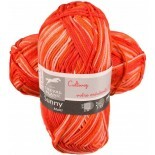 Sunny Multi by Cheval Blanc is a mercerized cotton.Composition 100% Cotton.It is woven with needles 3 to 3.5 mm and 3.5 mm crochet.Each skein is 50 grams and 125 meters.To make a short-sleeved jersey size 42, 8 skeins are needed. 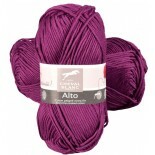 Alto de Cheval Blanc is a very soft yarn combed cotton, mercerized slightly. 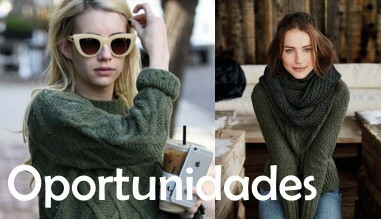 It is perfect for summer clothes, children and baby. Composition 100% cotton. 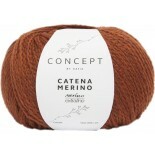 Each skein weighs 50 gr. 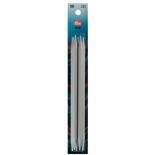 and measures 150 m. Knitting needles / crochet 3 -3.5 mm. 8 skeins can knit a sweater t42 short sleeves. Sample 10 x 10: 22 points x 30 laps. 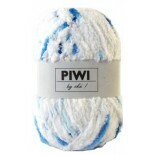 Piwi from Oke! 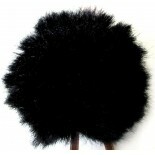 It is very soft and fluffy. It is a blucle, ideal for baby clothes, blankets, toys, etc ..It can be machine washed up to 30 degrees. 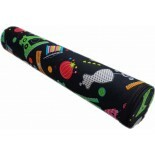 It is knitted with needles of 5 to 7 mm.Each ball weighs 50 grams and 100 meters long.Composition 100% polyester.